To the left is what someone who is experience can do! This is Mel's work that she did while there. It all looked so fabulous! Thanks for all the help Mel! Here is my piece...the top right two blocks don't go with the rest too well...but I do like the two pieces, they should be on a different project. This isn't the best picture but it will do. I really enjoyed the class and plan on getting a bag made to show Prudence when she comes back for the Knitting and Stitching show in October. 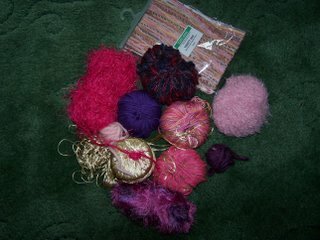 This is some of the stuff I bought at TAJ Crafts for the workshop. I didn't get to use all of it, but I'm looking forward to using it for my bag. And what is these you might ask??? Well...this is some of the other stuff I bought at TAJ. One of them is for presents....the purple, red and blue skein is Banana fiber. Isn't that cool? The redish and blue skeins are recycled sari's and the pink and orange is bamboo. Spent my allowance...so I have to be good now for awhile....I also bought several mags and a great book! Unexpected Knitting by Debbie New. It is wonderful! 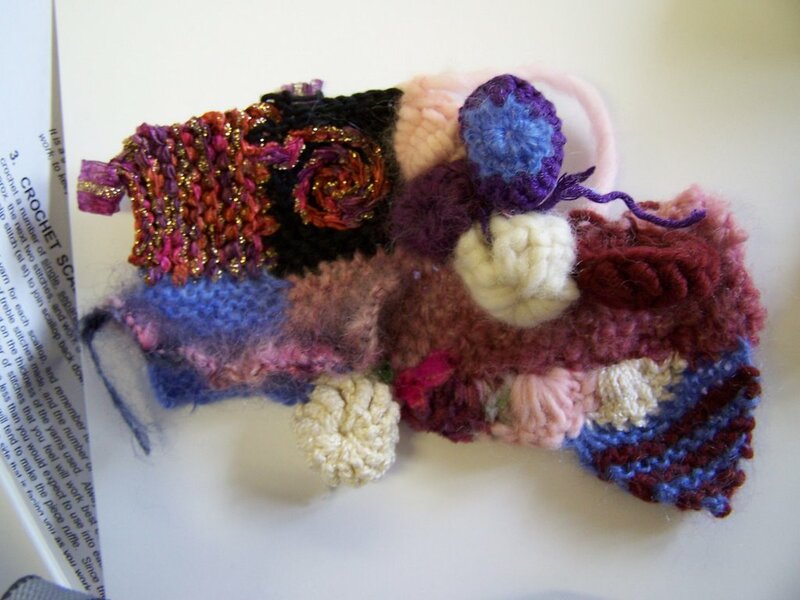 She gives the patterns for some of the work, but it really is a piece to just look at and get inspiration from! 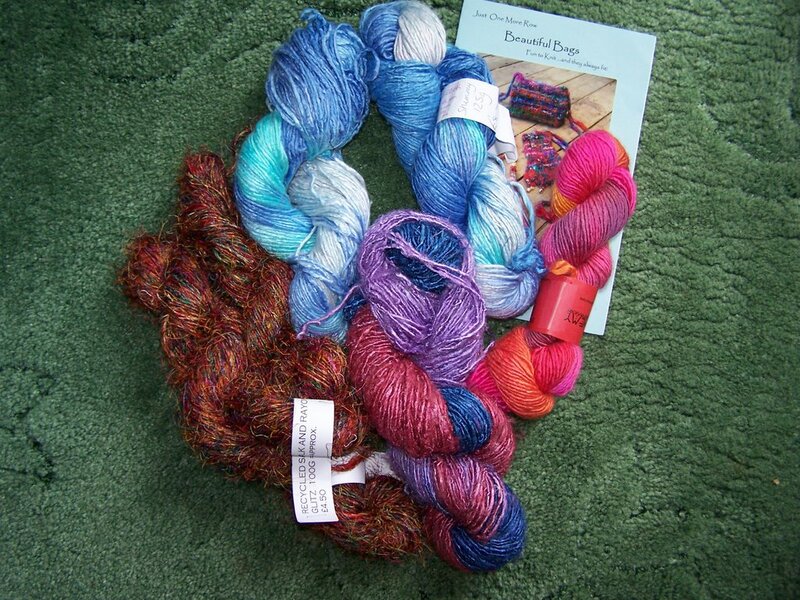 Oh, I guess I better confess that since I was buying a gift through Amazon...I also ordered Weekend Knitting. I've seen a couple projects on it that look really good, so we will see! Well...I did have to get the postage free, right??? Everything looks fab and you are so right about that free postage, everytime!!! You obviously had a great time, I am so envious, a weekend away would be a miracle with all my kids. You deserve one weekend away!!!! Well, actually you deserve more then that! Keep an eye out for a course you are interested in and go for it! It is great meeting new people! I like the piece you did. Very creative! 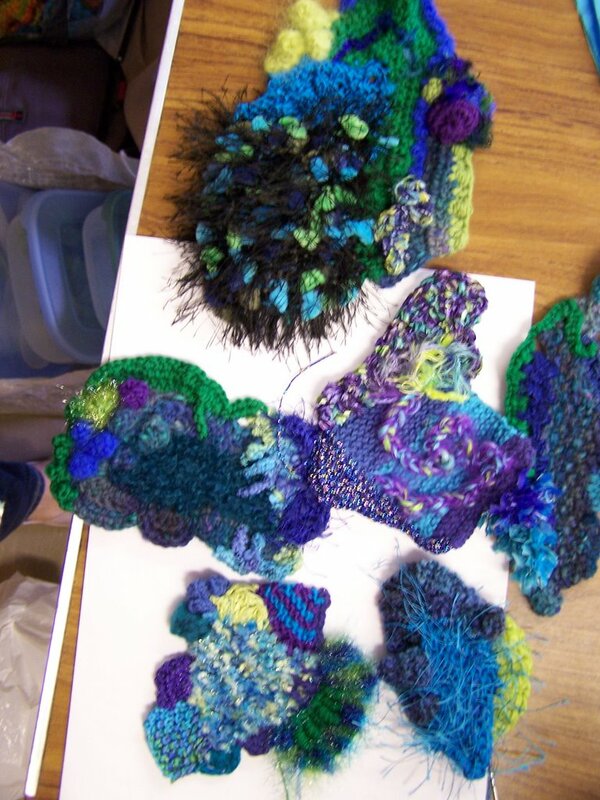 I hope my free-form knitting class at SMW is equally informative and interesting. those projects from your workshop are so cool. so how do i make them too? your teacher's name is prudence. does she travel and teach?